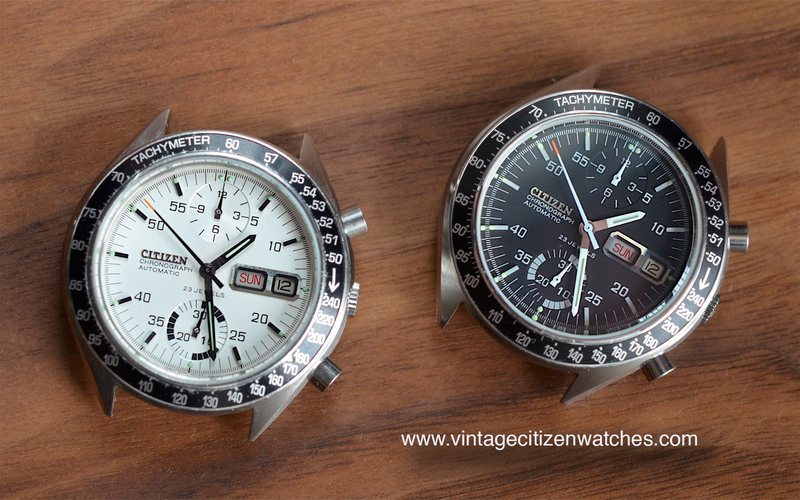 Finally, I found the time to write a few words about it, one the most desired vintage Citizen chronograph, the “Speedy”. It is called this way because of the resemblance with the well known Omega Speedmaster. 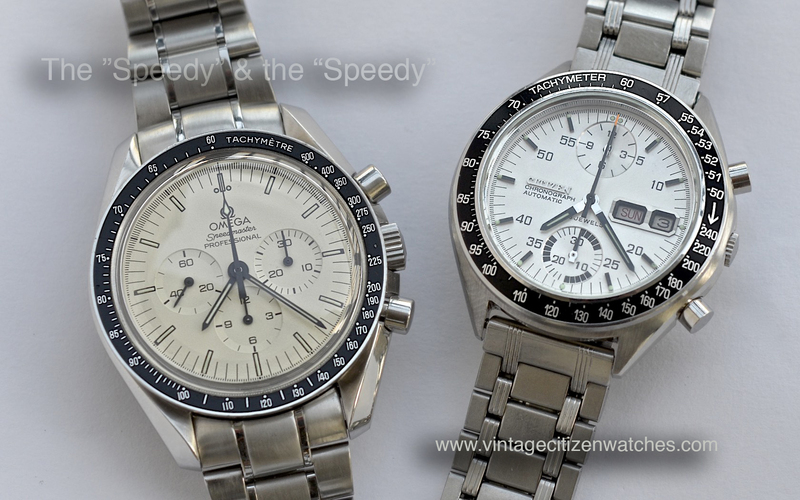 (did you know that there is a Speedmaster limited eddition of 500 with white dial, the “Albino”?) I like it a lot, (not because of the Moon watch) and it is one of my favorites, along with the Recordmaster and the octagon “Bullhead“. This one is also made of stainless steel and has all the DNA of a vintage Citizen chrono. The movement is the famous in-house calibre 8110A, that I wrote about quite a lot. It is an automatic, running at a high beat of 28,800. It is a fly back movement displaying both the date and the day of the week. It can also be manually wound. Most of the times when I see this model it is on leather straps, but originally it also came on a bracelet. The one in the picture is not the original type but any straight end 18mm one will do just fine. In fact this watch looks good on almost any strap you throw on it. UPDATE: Here is the pair, black dial, next to the white dial one. Which one do you like the best? 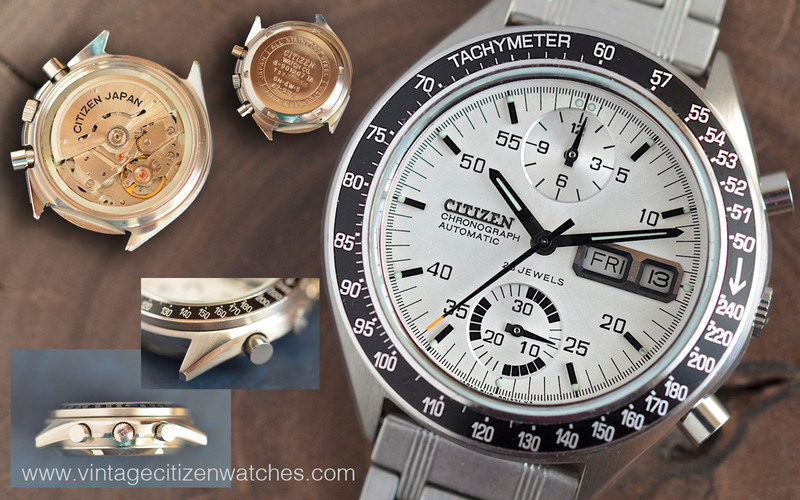 You can read more about other vintage Citizen chronographs on the dedicated page, HERE. This entry was posted in Citizen automatic chronograph, Citizen chronograph, day-date, hand winding chronograph, hi beat and tagged 67-9313, citizen 67-9313, citizen 8110, citizen 8110 speedy, Citizen 8110A, citizen speedmaster, CITIZEN SPEEDY, Omega Speedmaster, omega speedmaster albino, speedy albino, vintage automatic 8110, vintage citizen chrono, vintage citizen chronograph. Bookmark the permalink. I sent you a mail, waited three days for an answer… but in the end I sold the second one I had. 😦 Are you still interested if I will have another? Be interested to know when one white speedy citizen becomes available. If you or any contributor has one for sale please contact me. Hi Could you please add me to the list too please? Thank you kindly. I’m interested for white speedy. Please send me a mail if you have one. I’m interested for a white speedy. It’s possible to send me a email if any contributor have on to sell. I´m from Brazil and i see a citizen speedy with blue dial. It´s correct or a aftermarket? It depends. Show me some pictures. This model is ONLY black and white dial. Maybe it is another model? can i post picture here? how? Just upload them to a hosting site like http://tinypic.com (for example) and add the link here. The entire watch or only the dial is fake? I cant see the entire watch, but for sure what I see in your pictures is a NO. Stay away from it. Look at the pictures in my article. It will help. I’ll get the watch tomorrow from a friend and post more pictures. Hi, thank for the great post! How hard would it be to replace the dial of the speedy with a single subdial one like the one of the 67-9577? Would a 8100 movement fit inside the case of a 67-9313? I know they have a different height, but their width is the same. Thank you so much for you prompt reply. I am no watch expert and will definitely use a watch repair service to do it, but I do not want the parts of any 8100A or 8110A to be modified in any way. 1/ If you put a single dial on top of a 8110a movement, the axis of the top 12h register will stick out, but there is no hole for it in the single register dial: can the axis be removed / reduced without having any part modified (e.g. if the 8110A 12h axis has to be cut to fit with a single register dial I will definitely not ask for this to be done!!!) ? 3/ Can the full movement of a 67-9577 be easily fit in a 67-9313 case? This time since the movement of the 67-9577 is less deep than the one of the 67-9313, there might be some “clearance” and the 8100A might move within the case. 4/ Will the pushers of a 67-9313 case match with the pusher slots on the 8100A when it is fit inside the 67-9313 case? I would be very grateful if you could share your thoughts on the above potential issues. And… my answers 1 to 4 depend a LOT on the watchmaker. That’s great thank you so much for taking the time to answer :). I’m really interested in a white speedy. Any chance of emailing me if you or someone you know has one for sale? Thanks! I was just offered a mint white speedy, I will write you on your e-mail. if you have a NOS speedy please let me know. Very interested in a good condition one. Use to have, but sold. Hard to find good condition ones. And, as you learned it already, it is always cheaper to buy more expensive and better quality at first. Nevertheless, I will let you know if I find another one, meanwhile… I only have one NOS Citizen watch for sale: the Adorex. Thanks for the quick reply and yes if you get your hands on a decent one please let me know.